Did you know that household cleaning hacks (a.k.a. 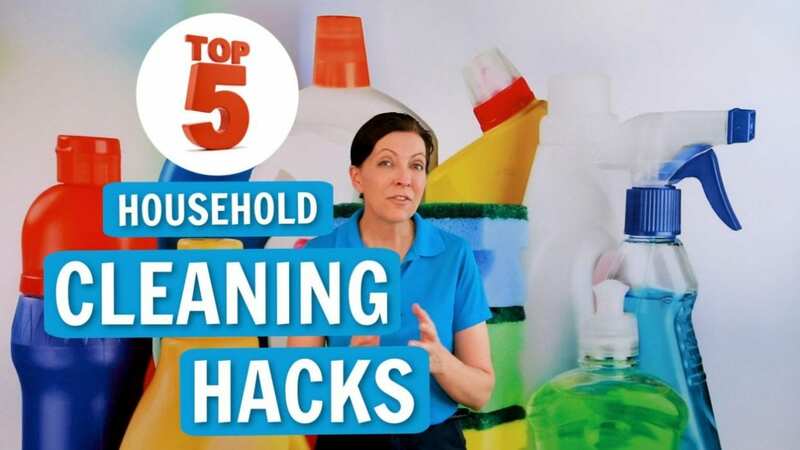 housework hacks, or cleaning tips and tricks) are bits of housework any savvy cleaner does daily? Angela Brown says easy house cleaning tips save time and energy as you clean and tidy your space. You don’t have to be a household hacker to enjoy these. Yes, that is a great question and we are going to talk about five or six of those today. Hi there, I’m Angela Brown, and this is Ask A House Cleaner. This is a show where you get to ask a house cleaning question, and I get to help you find an answer. A homeowner writes in, and she wants to know some cleaning hacks. These are like shortcuts. Well, I got news for you: there are no shortcuts in cleaning. If you’re going to do a thorough job you’ll have to actually clean. 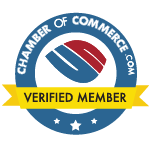 You can do maintenance cleaning, which will be quicker than if you do a onetime deep cleaning every so often. So, the cleaning hack is frequency, and then it will take a lot less time. 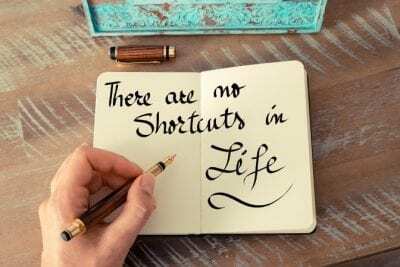 But there are no shortcuts. Alright, so the next thing I want to talk about is the One Touch method. Now, this is a great system that will help you get in the habit of touching things only once. So, let’s say that you get ready to go to bed at night, and you take off your shirt. That’s one touch. Don’t drop it on the couch. Because later you will have to pick it up and put it in the laundry. And then you’re going to have to take it out of the laundry and hang it up. Can you hang it up right now? Does it have any more life left in it? If no, then it goes in the hamper right now. You take it off, that’s one touch, it goes in the hamper. Now you’re done. You touched it once. If it goes on the hanger you took it off, and it goes on the hanger, that’s your one touch. The same rule applies with bath towels. You use your bath towel, one touch. You’re using it right now, what are you going to do with it next? So, what you do with it next is the one touch. Don’t set it down cause then you have to pick it up again and then it’s two touches. So, it either goes in the hamper or it goes hung up so that you can use it again. 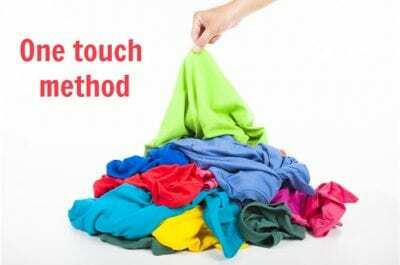 One Touch applies to groceries, book bags, and mail. When you bring the mail in, instead of setting it down on the counter go through it right now while it is in your hand. It’s one touch. Does this go in the bill paying section? Does this go in the trash? And guess what: in the mail today, that’s pretty much all there is. It’s either a bill or its junk. And so, am I going to put it in the bill stack, or am I going to put it in the garbage can? Don’t make a stack of it on your kitchen counter, that’s not where it goes, and that’s two touches. So, the One Touch system is a great household hack. Alright, another hack is to get one, give one. So, if somebody gives you something you are going to make sure that you give something away at the same time. 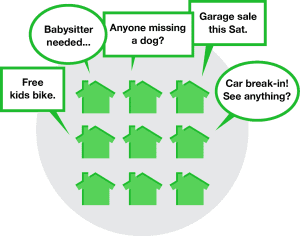 If you don’t have anybody that you want to give them away to you can use an app like NextDoor. Add your address and leave them outside. And within seconds they will be gone. Someone will pick them up and take them away. Bam! It really is that simple. 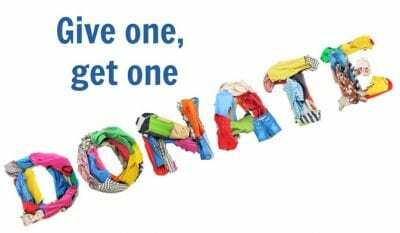 You don’t even have to go to the Goodwill, or the Salvation Army, or wherever you donate clothes. So, if you get something, give something up. Get a new pair of shoes, give an old pair away, right? That way you’re always creating space for the things that you have. You’re living a life of minimalism instead of just hoarding extra things. Alright, another household hack, and I recommend this for every one of every age. Whether you live in a house or an apartment, or a college dorm, this works. 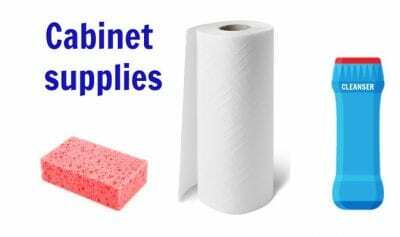 Underneath every bathroom sink keep a roll of paper towels and a non-scratch scrubby sponge. This you will use for the inside of your sinks, the outside of your toilet and the inside of your tub. Also, keep a jar of powder cleanser. When you start to see soap scum, a couple of shakes of the cleanser and a pinch of elbow grease and you’re good to go. Along with your cleaning tools under your sink, keep a wastebasket, and a bottle of all-purpose cleaner. Every day after you’ve dressed, shaved, put on your makeup etc. Tidy up the sink, vanity in your bathroom. This is part of your daily cleaning routine. If you have glass shower doors – squeegee them down after your shower. If you have a shower curtain, pull it out so it can drip dry. A bunched-up shower curtain encourages the growth of mold. A quick wipe down of your bathroom in the morning and evening will keep it in tip-top shape. 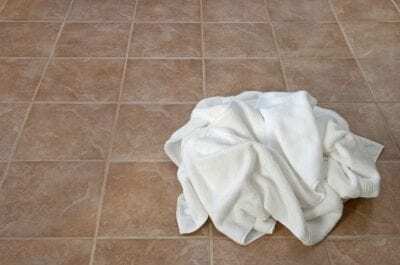 And if you’re cleaning your bathroom often, a half size sheet of a paper towel will do the trick. Clean the toilet last, and then toss the paper towel. Alright, another thing. We just talked about the shower curtain. If your shower curtain is icky, and there’s some gunk on it, you can wash it in the washing machine. Take the plastic shower curtain liner off the shower. Place it inside the washing machine. Add one cup of white cleaning vinegar in the soap dispenser, and run it through a cycle. And that will erase all the mold, and the gunk, and the water spots, and all the stuff from your shower curtain. 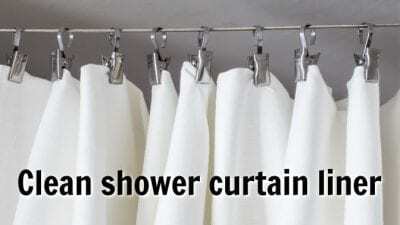 Take the washed shower curtain out of the laundry and hang it back in the bathroom shower. Stretch it the width of the tub so it will drip dry, and the vinegar you just washed it in will keep it from spotting. Alright, one more hack before we’re done here is all about microwave maintenance. Because the microwave gets used a lot in most people’s homes. And sometimes people cook things and they forget to put a lid on their food. 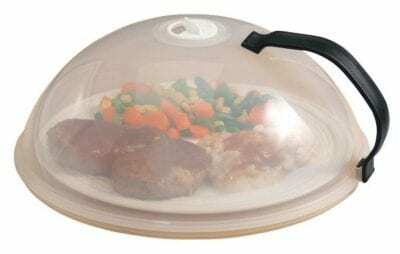 So, a household hack is to buy a microwavable dish cover for your food. It’s got air vents in the top, and it just fits over a plate of food. And use it every time you microwave food. This will keep your food from drying out. Your food will be nice and moist, and your microwave will remain clean. If you do splatter – take a shallow bowl of water and heat it for three or four minutes. This will create a boiling effect and steam the inside of your microwave. 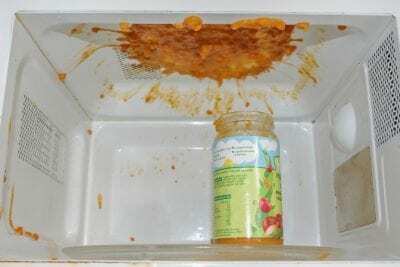 NOTE: Do not use your microwavable lid cover for this exercise. Once the microwave is steamy, and all the dried food and gunk is loose, you can wipe it clean with a paper towel. But it’s easier to just cover your food and prevent the splatters from happening. There is no reason to toil for hours cleaning up things in your house. The secret is to maintain them as you go to make the job easy on everyone. What are your favorite household cleaning hacks?